I totally forgot to post these pictures! 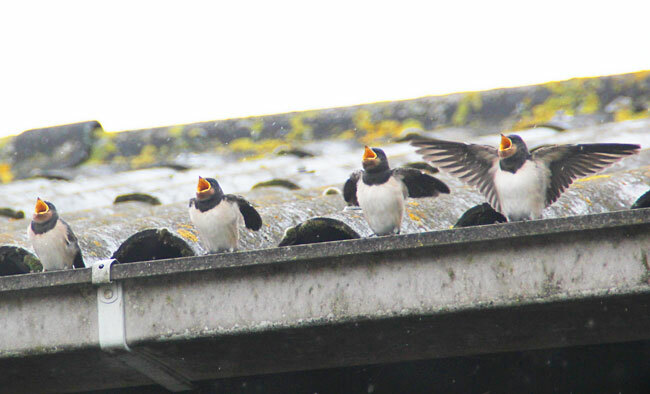 This was the day after the swallows in our stables got out of their nest. 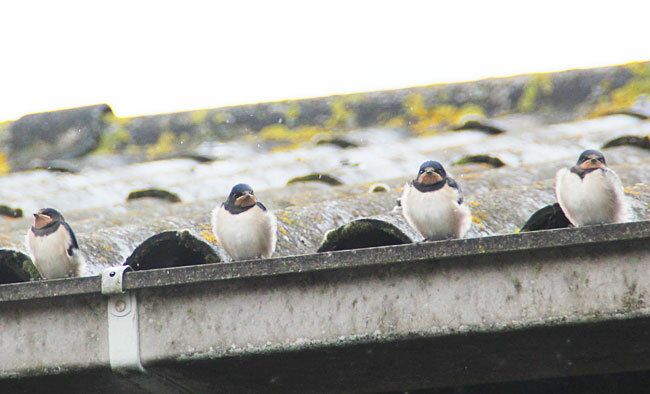 These grumpy little guys sat on top of our shed in the pouring rain waiting for the mom to feed them. When she flew by they made the cutest (and loudest) chirping sound, flapped their tiny wings, opened their mouths wide and the mom would put her whole face in there! Adorable! 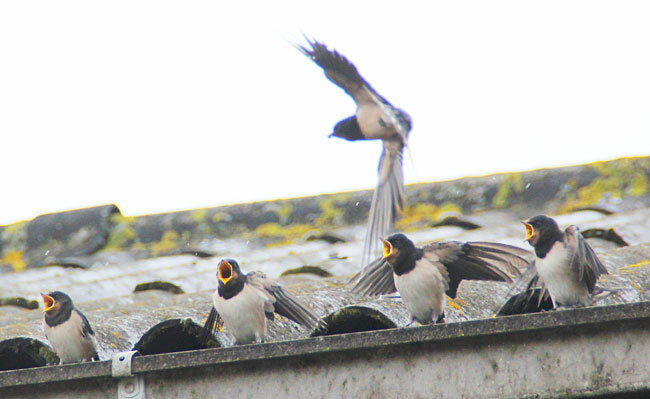 She gave them flying lessons off the roof later but I didn't snap any pictures of that, I didn't want to disturb them. On a completely different note, my drawing skills are on an all time low lately. I was working on a present for my sister for two days straight but got so frustrated I just gave up and threw it out. It's not just that, the projects before this didn't exactly go smooth either and my inspiration is nowhere to be found. I do want to make stuff, but it's like my hands just don't do what I tell them to (it's like that brilliant Clive Barker story in Quicksilver Highway, about hands that rebel against the body. My hands are trying to start a sucky-drawing revolution. I just hope they'll stay attached to my arms). It's not so bad, I know I will get out of it, but I'm just not sure if I should take a break from drawing for a while or if I should just keep going. My lack of sleep isn't exactly helpen either. Daargh! I think I'm just going to clean my workspace like crazy today, and see if that'll help clear my mind. Hope you all have a nice day! en je komt er vast & zeker doorheen, iedereen heeft wel eens een dipje! En ja hoor, ik geloof dat ik er zelfs al doorheen ben :) ik had gewoon even last van een slecht humeurtje geloof ik ;) opruimen en gewoon aan het werk gaan was het beste plan!